I am a little late to the washi tape craze! When Close To My Heart added washi tape to the catalog line up....I finally caved and purchased a roll. This is my first card using the tape. I have to admit...I can see why so many of you are fans of washi tape. The tape goes on so smoothly and you can even re-position with ease! I am sure more colors will be added to my collection soon! Thanks so much for stopping by! 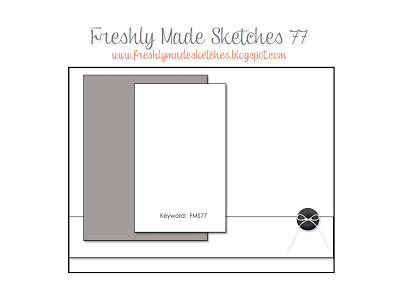 Hope to see your creation over at Freshly Made Sketches! Beautiful card Allisa. Thanks for joining us at Stamping Sensations this month. I was wondering what the "buzz" was about with this tape. I, too, have not used it. It's repositionable? It looks great on this card - I think I need to try it too. Love the new stamp too, I was trying to decide if it was as cute as it is in the catalog - it is way cuter on your card! Gorgeous card Allisa! I love the burlap and designer papers. Once again...I card that so lovely!!! Makes me want to go straight home and CREATE! Beautiful card Allisa! I love those bees! The burlap is so fun - so is that flower! Love it! Absolutely gorgeous in all ways right down to the cute little flower! I never thought I would like bees so much, but you've convinced me that they are pretty fantastic! I love these colors, the washi, the bit of burlap and that very sweet flower! 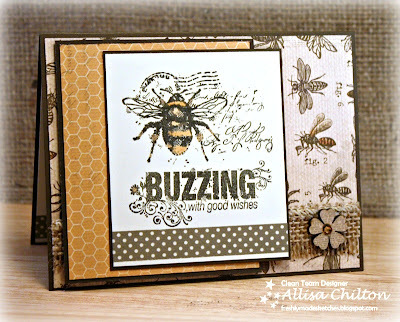 Your bee theme is totally rubbing off on my - I love these papers and the images & sentiment you've used - love this card Allisa! A really great take on our theme Allisa. 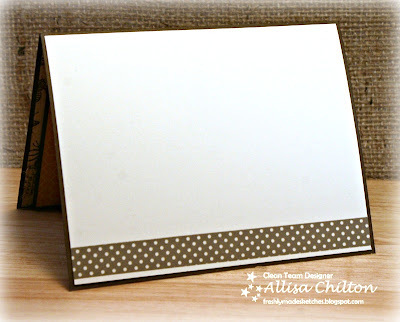 Thanks so much to sharing with us at Stamping Sensations challenge. What a fun card to get from someone! I love your colors and your design. I have the burlap ribbon but have not used it yet! Thanks for sharing. I'm loving the bee theme with the great image and all the honeycomb in the background! Fantastic card! Wow! 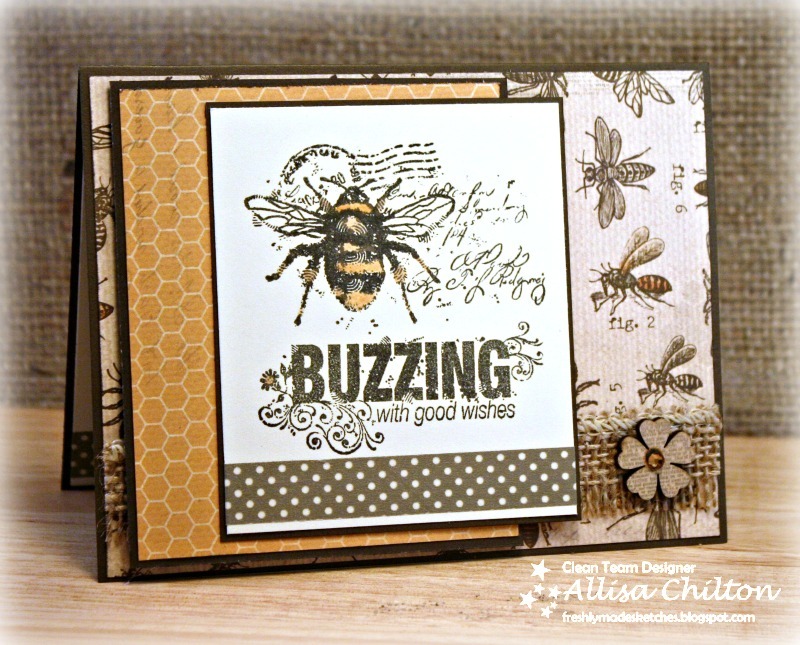 I would make lots of bee cards too if I was as good at it as you! You know how to work those bees. A Fabulous card! Thanks for joining in our 'Great Outdoors' challenge at Stamping sensations and good luck! Allisa, I have come to love your incredible talent for combining stamps and papers for card making perfection, and this card is no exception! Very beautifully done! I was in love with this the minute I saw it in the DT gallery! Wow, wow, wow! Love that little bit of burlap too. Ah, the washi tape. Trying to hold off but I suspect I won't be able to much longer. Way cool Allisa! You have such a wonderful style - I always enjoy your cards! Great choice for our "in the air" theme this week at 'ABC' Challenges. Thanks for playing along. Alissa this card is so beautiful! I love that stamp and patterned paper!